Spondylosis, also known as spinal arthritis is common, an age-related condition that affects the joints and discs in your neck and back. 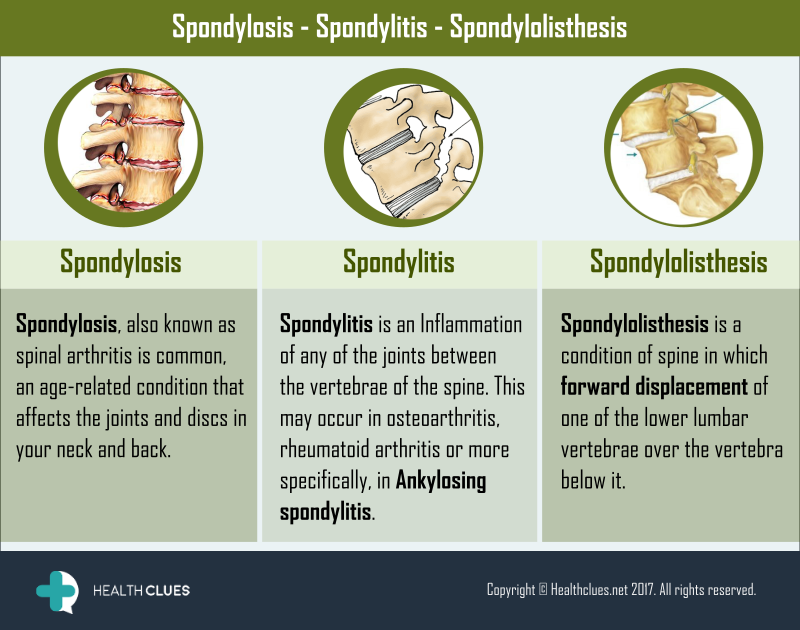 Spondylitis is an Inflammation of any of the joints between the vertebrae of the spine. This may occur in osteoarthritis, rheumatoid arthritis or more specifically, in Ankylosing spondylitis. Spondylolisthesis is a condition of the spine in which forward displacement of one of the lower lumbar vertebrae over the vertebra below it. Back Pain, Cervical Spondylosis, Infographics ankylosing spondylitis, osteoarthritis, rheumatoid arthritis, spine, spine arthritis, spine surgery, Spondylitis, Spondylolisthesis, spondylosis. permalink. Thanks for sharing this great information in a simple and understanding way, by differentiating this three major yet common spine problems.